Earlier this year, Rolling Stone reported on a series of musical stamps coming out this year that took years of planning to come to fruition. Now that the Jimi Hendrix stamp has been officially released as the first offering of the United States Postal Service's Music Icons series, the agency has unveiled the official stamp for the series' next star Janis Joplin. According to Linn's Stamp News, the stamp will be released this August and will feature the singer smiling and wearing shades surrounded by a psychedelic background and lettering evoking the popular font of the Sixties. 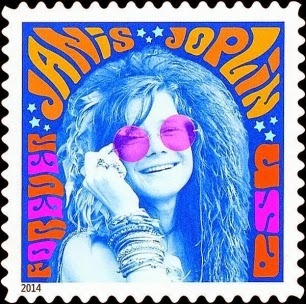 A biographical description on the sheet of 16 stamps says: "Janis Joplin (1943-1970) was a groundbreaking singer whose powerful, bluesy voice propelled her to the pinnacle of rock stardom. An icon of the 1960s, she was known for her uninhibited and soulful performances. Joplin is now recognized as one of the greatest rock singers of all time, as well as a pioneer who paved the way for other women in rock music." No information on the specific date and location of the stamp issue has been announced. Joplin, who would have turned 71 this year, and Hendrix are the latest subjects to join the Music Icons series, which had previously honored Johnny Cash, Ray Charles and Tejano songstress Lydia Mendoza in 2012. Earlier this year, it was revealed that more musicians may appear on a U.S. stamp, including John Lennon, Jim Morrison, Bill Monroe, Sarah Vaughan and Tammy Wynette. There are also plans for an issue honoring James Brown and a re-release of the 1993 Elvis Presley stamp for 2015. Susan McGowan, the USPS director of stamp services, told Rolling Stone that 2015 should see a departure from rock & roll, but declined to reveal which genre will be its focus. "I definitely see that we need to pay a little honor to some other genres that haven't been covered," she says. "For example, jazz is something that will be in the foreseeable future, or Motown and types of music that we need to recognize."